Browse our selections below and use our easy filters to narrow your search! Licorice-scented silvery green narrow foliage complements the gorgeous sprays of coral-orange flowers with contrasting rosy violet buds. 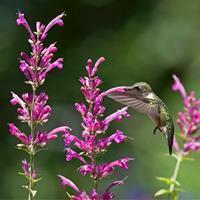 The elegant spires of bloom and fine foliage creates a haze of color all summer and fall. Deadhead to continue ample bloom. Best in very well-drained soils with a gravel mulch. 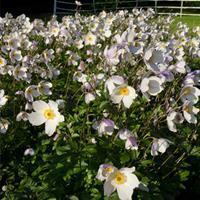 Avoid heavy clay soils for successful overwintering, and wait until earliest spring to cut back. Drought tolerant once established, water regularly the first year. 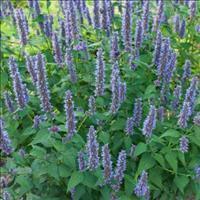 An award winning new variety that is turning heads all across the country, and no wonder, for it has huge vivid blue-violet flower spikes that keep on blooming all summer and fall. 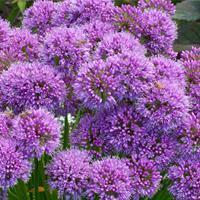 It has sturdy, non-brittle stems and healthy foliage, outstanding heat and humidity tolerance, and easy care. 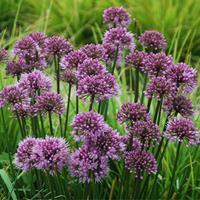 Provide fertile, sharply well-drained, even gritty soils. Patented. 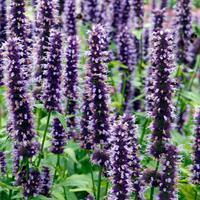 An easy and rewarding Agastache with dark green flawless foliage emitting a potent lemony fragrance, plus lavender-blue flower spikes that draw bumblebees like kids to lollipops. Blooms midsummer to fall. PPAF. 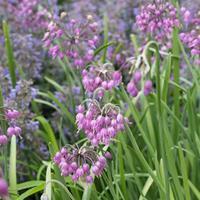 A super hardy floriferous and compact selection that thrives in dry and hot summer areas as well as more northerly gardens in very well-drained, even gritty soils. Early blooming and long blooming, with large wands of rosy pink flowers and minty scented foliage that is used in teas and reported to repel mosquitos! Our first and still most favorite agastache that hummers love too- we often see them buzz possessively around the abundant blossoms. This tough as nails selection from Ginny Hunt is tall and graceful with masses of peachy-pink flower wands blooming all summer and fall, one of the longest flowering selections! For well-drained, even sharply drained soils. 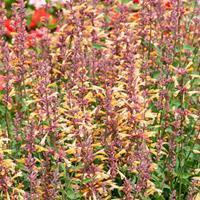 Deadhead and supply regular watering until established, when it will tolerate periods of drought. Wait until spring to cut back for enhanced winter survival. Ageratums were introduced in 1822. 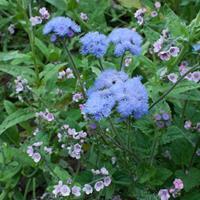 These amethyst blue fuzzy flowers have long-lasting blooms in the garden and vase. The sturdy, rough-textured leaves are tinged with purple. Self sows. Purple red fuzzy blooms are soft as a kitten’s ear and bloom in summer atop long stems, making it a florists go to variety for adding texture to summer bouquets. Lovely in the mixed border also, it tolerates partly shaded sites with ease. This demure flower was found in nurserywoman Elizabeth MacGregor’s garden (fancy that!) and has since gone on to fame in England and the US, prized for its amazing hybrid vigor, its unabashed blooming power, and its reticence to spread into neighboring plantings. The large white flowers (3” or more) open wide during the day, and close as twilight approaches to a nodding bell brushed in dusky violet. Provide humus rich moist, yet well drained soils and deadhead for flowers from spring to frost. Patented. 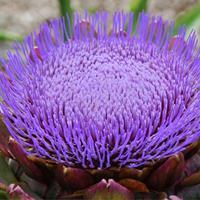 Grow for the spectacular purple flowers or harvest sweet flavored, tender, purple-tipped buds in 90-95 days. Bred for early production, the nearly thornless 3-4 foot plants average 7-8 delicious buds a piece.